Can you imagine Christmas and New Year holidays without some cookies? There are so many wonderful recipes for this occasion; Holiday Red Velvet Kiss Cookies are only one of them. 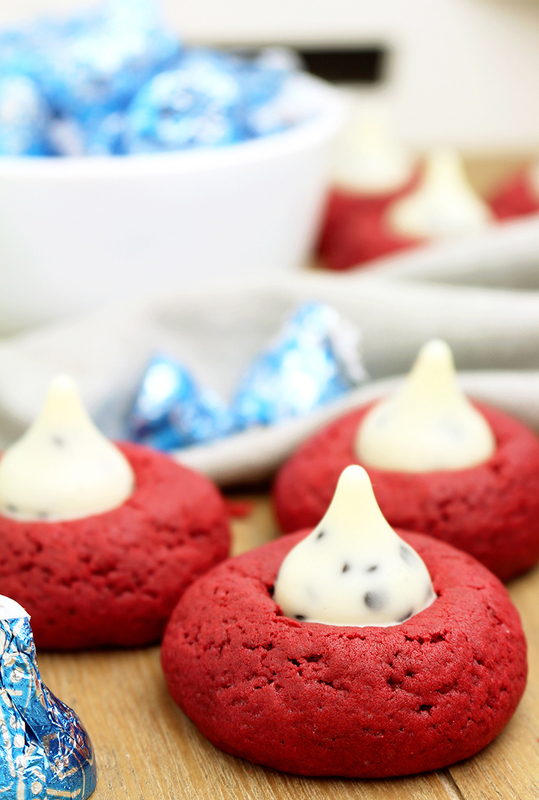 Holiday Red Velvet Kiss Cookies are great for Valentine‘s Day and for all those who want to surprise their loved ones and sweeten this special day. I love to make cookies. I enjoy every step of the preparation and finally to enjoy their taste with the people I love ♥. There is always a plate with cookies in my home. They give some special warmth and charm. If you are planning to make cookies for the upcoming holidays, I have a few suggestions for you. My personal favorite and the most popular post on the blog are Chocolate Chip Cheesecake Cookies that can be a part of your holiday meal. For Christmas and New Year, I suggest Holiday Maraschino Cherry Shortbread Cookies and Chocolate Crinkle Cookies. Valentine‘s Maraschino Cherry Shortbread Cookies are perfect for Valentine’s Day. 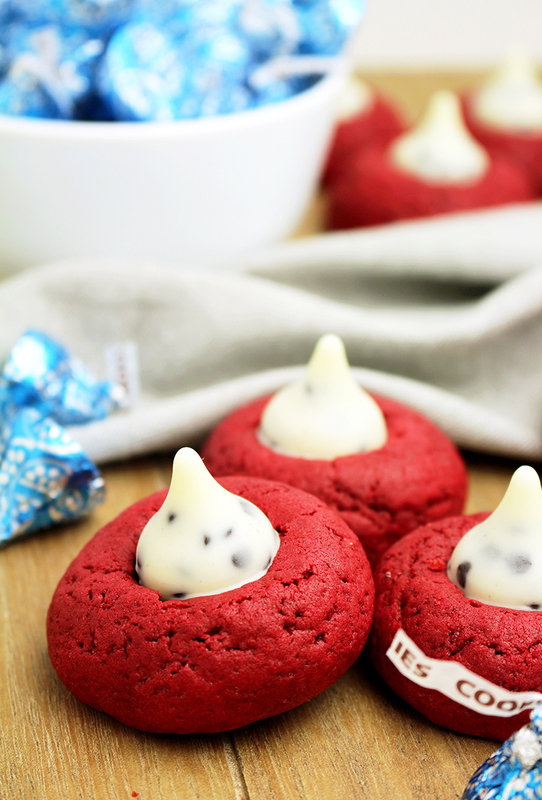 Holiday Red Velvet Kiss Cookies are ready. I am expecting some company and it is going to be a surprise for them. 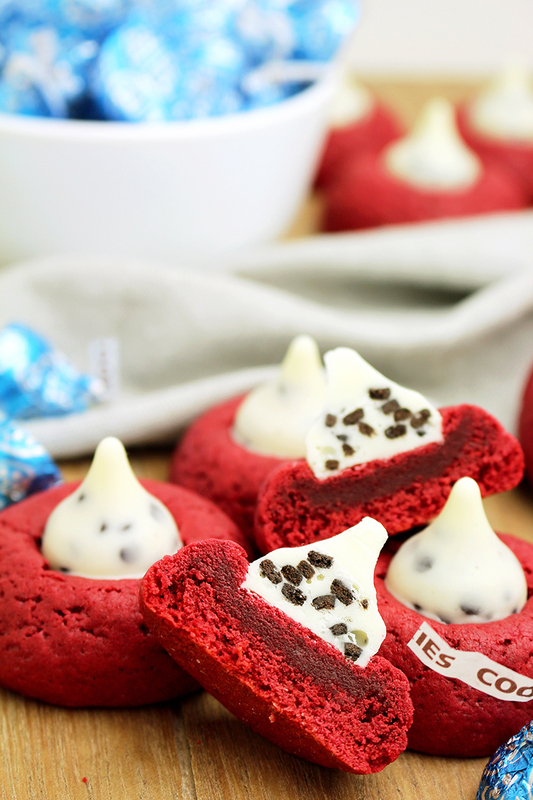 What do you need to make this Red Velvet Kiss Cookies? I love holidays and the holiday atmosphere. I enjoy spending time with my loved ones, good food and parties. 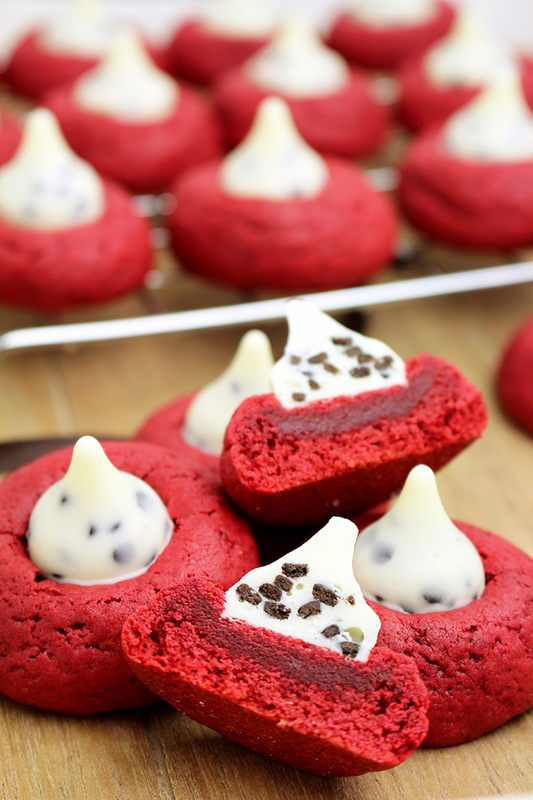 How to prepare this Red Velvet Kiss Cookies? In a large dish combine flour, unsweetened cocoa, baking soda, baking powder and salt. Set aside. In a separate dish, mix butter using electric mixer, medium speed, 30 seconds to a minute. Add light brown and granulated sugar, and then mix for 1 minute, medium speed, then at maximum speed for about 2 minutes, until it’s light and fluffy. Add an egg, heavy cream, vanilla and red color and mix until well combined. Finally, add dry ingredients and mix until you get fine dough. Cover with plastic foil and leave in the fridge for 1 hour. Take the dough out of the fridge and make balls with 1½ tablespoons of dough. There should be around 22 cookies. 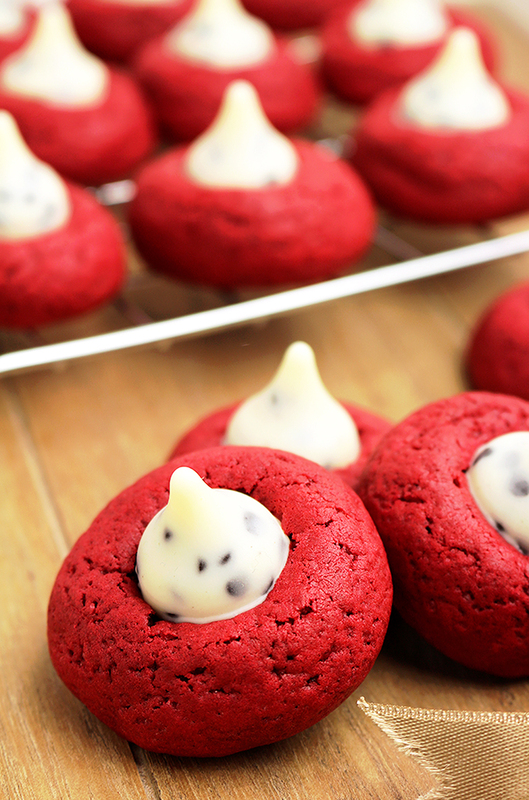 Put them in the baking sheets. The cookies should be minimum 1.75 inch apart. Bake for 10-11 minutes. 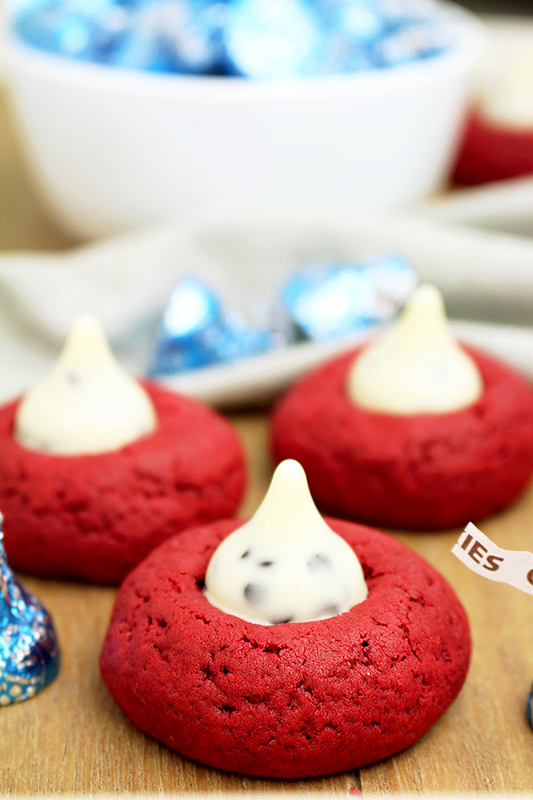 Take them out of the oven and immediately put Hershey’s kisses, by pressing them on the top of the cookies. Store them in a well sealed container.